This strongly individualised portrayal of a 58-year-old man is a particularly fine example of Mierevelt’s late oeuvre. It is a mature artist’s portrait of an individual of his own generation. The contrapposto pose is typical of the artist: bust-length, facing right, and the measurements are also standard. 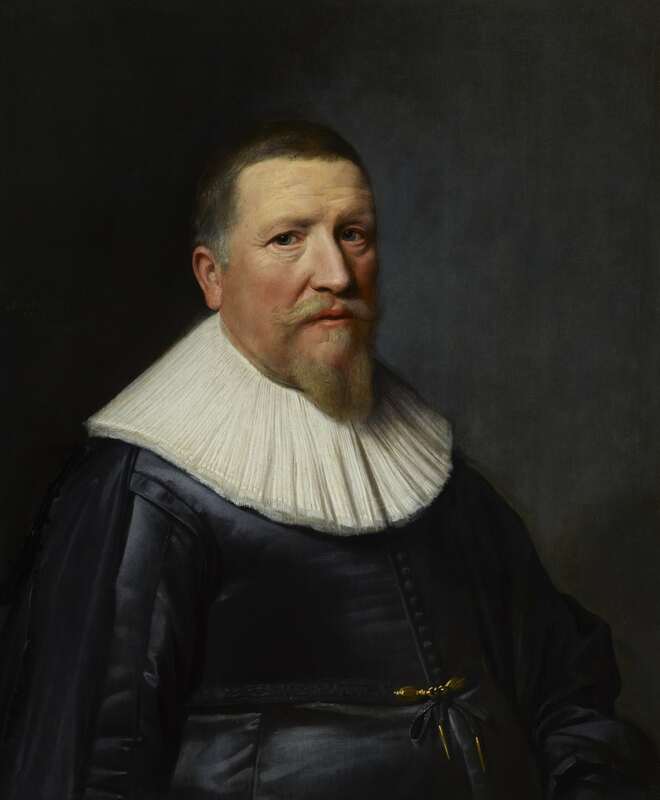 While the shape of the sitter’s dropped collar originated in the second half of the 1620s and was somewhat old-fashioned at the time, Fred Meijer has observed that an older man of fifty-eight would not have dressed according to the latest style. He wears a sumptuously shiny black satin doublet, closed at the front with a neat row of small cloth-covered buttons and a waist-band closed with a brass clasp and lace chapes and a black cape of the same satin. These are the clothes of a successful merchant, or burgher. His short hair, beard and moustache, expertly rendered by Mierevelt, were rather common for men of his age at the time. The sitter cannot be identified other than his age, as there is no coat-of-arms, specific attribute or inscription. He was probably a wealthy citizen of Delft or of a neighbouring city. As well as being a member of the painter’s guild in Delft, Mierevelt was also a member of the guild in The Hague, from 1625 to 1634. He was undoubtedly one of the leading Dutch portraitists of his time, mainly working for the upper class in Delft and The Hague, as well as for the princely court. This was an extraordinary achievement for an artist of fairly humble beginnings. Born in Delft in 1567, Mierevelt was the son of a goldsmith. He was firstly apprenticed to the copperplate engraver Hieronymous Wierix, and then to the painter Willem Willemsz.. Mierevelt showed precocious talent and in 1581 was invited by the artist Anthonie van Montfoort (also known as Blocklandt.) to enter his school at Utrecht, after he had seen two of Mierevelt’s early engravings, Christ and the Samaritan and Judith and Holofernes. Two years later, he returned to Delft, and became an officer of the Guild of St. Luke as early as 1589. Unfortunately, little of Mierevelt’s early oeuvre survives, a time when he devoted himself to still lives and history subjects. However, from 1590 he devoted himself almost entirely to the art of portraiture, and it was as a portraitist that he achieved fame and fortune. He was described and praised specifically as a portraitist in 1604 by the contemporary historian, Karel van Mander, in his ‘Schilder-boek’. Indeed, Mierevelt achieved such success at the time that his studio became one of the largest in operation. In 1607 he was appointed official painter of the Stadholder court of Mauritsz, the Prince of Orange-Nassau, in The Hague, whom he portrayed in the same year (Stadhuis, Delft). Thereafter, he was regularly employed to paint official portraits destined as diplomatic gifts. Mierevelt’s role as court painter also emphasised his status as the most fashionable portraitist of his day, receiving commissions not only from noble families of the Dutch Republic but also from visitors from abroad. His foreign sitters included many English clients who sat for him whilst on their travels to the Netherlands, notably Sir Dudley Carleton (Montacute House, Somerset) and Edward Cecil, Viscount Wimbledon (NPG, London). In his autobiography of 1631, Constantijn Huygens described Mierevelt as ‘the leader in this field [portraiture]. Who he is and how great he is, is known not only in Delft, the Netherlands, Belgium and Europe, but, I truly believe, throughout the world’. Many of the artist’s pupils and assistants rose to fame, including Paulus Moreelse and Jan Antonisz. Van Raveteyn. His portrait was painted by Sir Anthony Van Dyck, and engraved by Jacob Delff. 7 Ekkart, R. The Grove Dictionary of Art, entry on Michiel van Miereveld. Mierevelt’s popularity in England may be easily understood if one compares his work to that of British court painters such as Robert Peake, John de Critz and Marcus Gheeraerts the Younger. Prince Henry, was so impressed by Mierevelt’s work that in 1611 he made several attempts to persuade him to come to England as Court Painter.